Once again Milan demonstrates that it is an emerging leader in sustainable urban architecture and engineering. 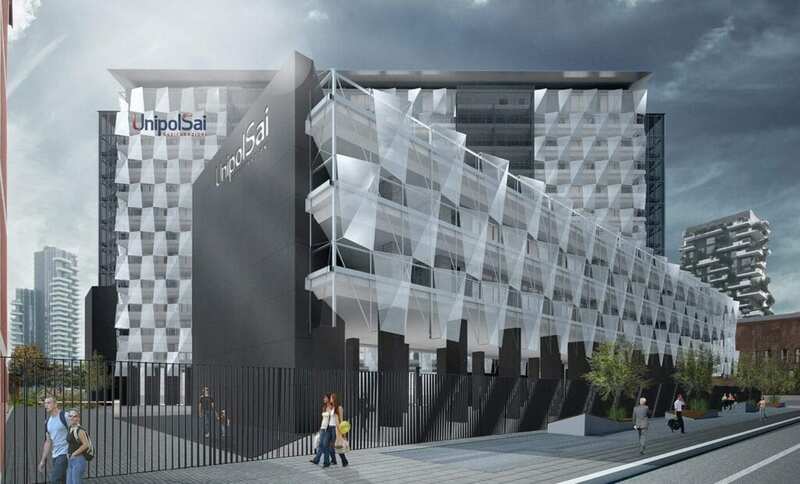 Architect Massimo Roj, CEO of Progetto CMR is transforming a once derelict and abandoned building into a “building of the future” for the new UnipolSai headquarters in the Isola district of Milan, Italy. The building due for inauguration in 2019 boasts state of the art materials, design, and engineering that will significantly cut down on pollution. Made of a prismatic glass façade and balconies paved with reflective ceramic tiles, the natural light reflected will proficiently illuminate over 20,000 m2 of office space, therefore, reducing energy consumption up to 50%. External stoneware surfaces will be coated with titanium dioxide, an innovative finish that actively contributes to reducing local air pollution by triggering a photocatalytic process permitting the “dissolution” of pollutants. In addition, photovoltaic solar panels will reduce CO2 emissions by about 13 tons per year. The building, “De Castilla 23” will also feature a 2,000 m2 leafy urban park which will absorb an estimated 12 tons of CO2 per year and release 9 tons of oxygen, according to research conducted by the CMR research team.